Pirates have been a part of popular culture ever since they first appeared on the high seas with aspirations for fortune, fame and glory. Stories about the exploits of pirates fascinated the people of the 17th and 18th centuries. Even 300 years later, the tales of Long John Silver, Captain Hook and Jack Sparrow are as popular now as they've ever been. But are these depictions of pirates based on reality? 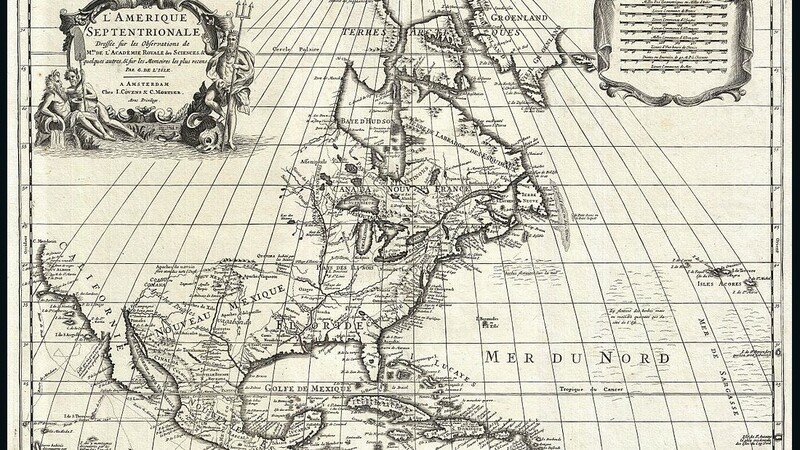 Was there really an X on the map, buried treasure, a black flag with a skull and crossbones flapping in the wind? Did duels to the death really take place between naval authorities and these wild men of the seas? But the real stories are more amazing that anything seen on the big screen. 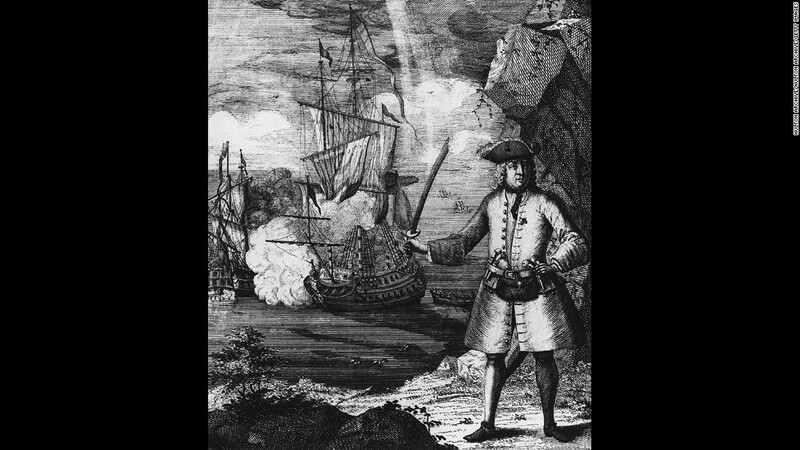 Captain Henry Avery: One of the most famous pirates of all time. If one man can be said to have inspired the so-called Golden Age of Piracy, it's Captain Henry Avery. In his book, "The Republic of Pirates," Colin Woodard writes that Avery's "adventures inspired plays and novels, historians and newspaper writers, and, ultimately the Golden Age pirates themselves." "He was a really important inspiration and symbol to the subsequent generation who became the Golden Age pirates," Woodard tells CNN. "Part of the reason is that Henry Avery became a pop culture phenomenon when these other pirates would have been children and teenagers." By the time they were young men, Avery was a legend. A sailor aboard a merchant vessel, Avery, like many other sailors, was getting increasingly disillusioned with the way the system worked. "Sailors were so badly treated in many of these merchant vessels by the captains and owners," Woodard says. "They were given lousy rations, cheated out of their pay at the end of journeys, often fed spoiled food and placed on vessels that intentionally didn't have enough provisions on board." In 1694 Avery rounded up others to the cause of freedom, riches and glory and seized a ship under the cover of darkness while its captain, Charles Gibson, was sleeping in his quarters. Avery placed Gibson in a rowboat before sailing away, reportedly telling him: "I am a man of fortune, and must seek my fortune." Avery and his crew sailed for the Indian Ocean, using Madagascar as their base of operations. Soon they came across and took a ship belonging to an Indian emperor. Accounts vary on what happened aboard the ship but they all agree on one thing -- Avery made off with staggering haul of money, jewels, gold, silver and ivory, worth more than $200 million today. Avery had his fortune and each member of his crew received the equivalent of 20 years of wages aboard a merchant vessel. With his ship laden with treasure and naval forces all over the world scrambling to track him down, Avery sailed for the Bahamas where he bribed the governor of Nassau with ivory and weapons into allowing him to ditch his ship and take a smaller vessel, bound for Europe. Landing in Ireland, he bid his crew farewell. Then he and his plunder disappeared into history, never to be heard from again. Rumor and myth surrounds Avery's fate. One report claimed Avery died a beggar, cheated out of his fortune. Another had him returning to Madagascar as king of the pirates, ruling over a piratical empire with a squadron of ships commanded from a fortified palace. "Avery is one of the very few who turned full pirate and got away with it," Matt Albers of the Pirate History Podcast says. "He just disappeared into the winds of history. "It might be that he died as a penniless beggar on the streets of London or he may have died with a fabulous kingdom out in the jungle somewhere. "No one is entirely sure what happened to him. But we do know that he was never taken by the authorities." Getting away with it was a 17th-century thing. For the men he inspired in the early 18th century there would be few, if any, happy endings. "The thing about those famous pirates is that all of them got caught," Albers says. "At some point they had a run in with the authorities that didn't go well for them." 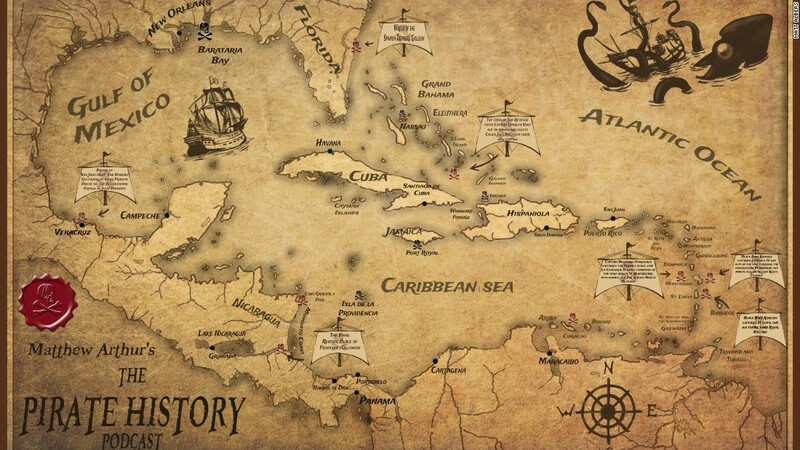 A map of the Caribbean depicting some of the pirates' bases and the location of significant events. David Wilson, an academic specializing in historical piracy, says authorities tried to push stories of piratical downfall as a deterrent. "Really they're trying to publicize that piracy ends in death," he says. "The message is these men meet their doom through piracy to try to discourage any future pirates." And there were plenty to choose from. "Black Sam'" Bellamy, for example, was a rising star in the pirate world, calling himself "the Robin Hood of the Seas." In 1715, at the age of 26, as captain of his own ship, the Whydah, he was the most feared man up and down the Americas. Having amassed a small fortune and a reputation for being unbeatable, he was sailing for Cape Cod in 1717 when disaster struck. "Cape Cod had a weather system that would drive ships against the brutal cliffs of sand and shoals," Woodard explains. The Whydah was caught in a storm and ran aground with shocking force and sank with its treasure still on board. Some 160 men perished and Bellamy's body was never recovered. Newspapers of the day claimed God had punished him for becoming a pirate. 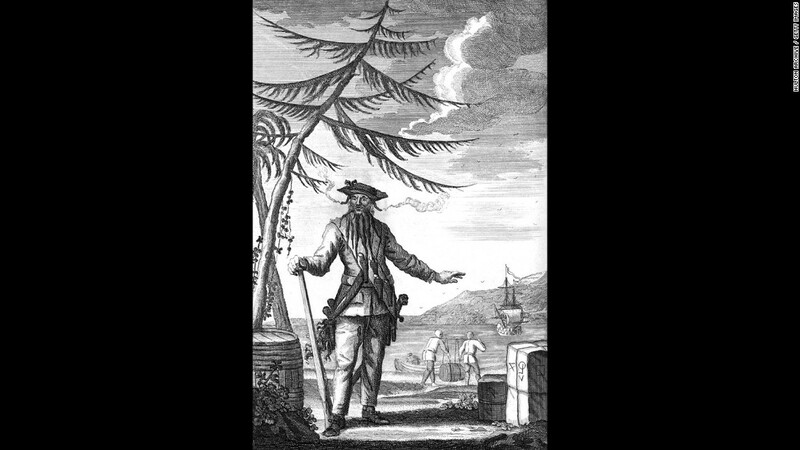 Another famous story is that of Calico Jack Rackham, named for the flamboyant Calico clothing he liked to wear. As a pirate, Rackham was pretty unsuccessful. He was captured quite easily in 1720 and hanged. It's the one we all associate as the pirate flag, the skull and crossbones, the Jolly Roger. Made famous by Robert Louis Stevenson's "Treasure Island." "They all had different flags and black flags with all these different symbols on," Wilson says. "They all had symbols of death in some way or other just to enact fear in ships. "If you could throw that flag up and the ship gives in without a fight you're doing much better than if you had to then engage with them." 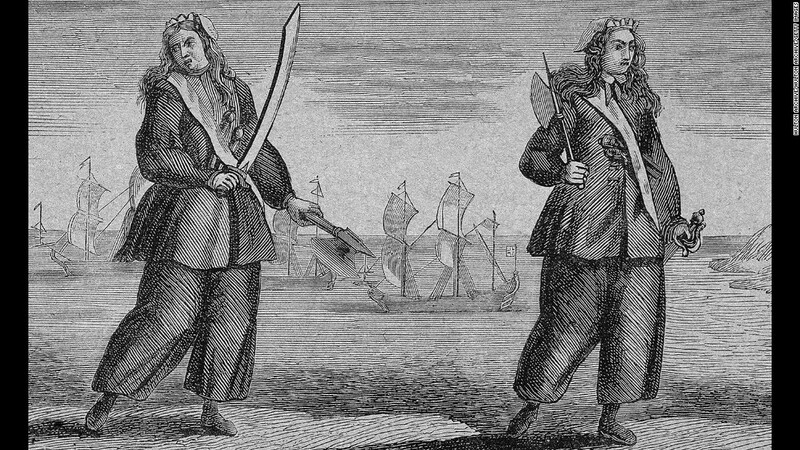 Engraving of female pirates Anne Bonny and Mary Read holding swords. Rackham is also famous for the company he was keeping when he was arrested: Mary Read and Anne Bonny, the only known female pirates of the era. "There was Ching Shih in China but she wasn't so much a pirate as a pirate queen who ran a pirate empire," Albers says. "The same with Grace O'Malley in Ireland, less an actual pirate and more someone who ran the pirates' base." Rackham's female crewmates helped cement his own myth and legend, Wilson adds. "A lot is made out of the female pirates, there were some but they were an anomaly, as were any women on sailing ships at that time," says Charles Ewen, professor of anthropology at East Carolina University. "Usually they were just passengers, but there were female sailors from time to time. But for the most part they were a disruptive influence." Read and Bonny were to be tried on charges of piracy and surely hanged. But, knowing that expectant mothers were exempt from the gallows, both women seduced guards while being held captive and fell pregnant. "Their histories are fairly short and I think that the reason they're so popular is because of their trial," Albers explains. Their arrest and the subsequent escape from the noose was big news in the London press at the time, but no one got more coverage than the notorious Edward Teach, the most fearsome of all the Golden Age Pirates. A man more commonly referred to as Blackbeard. In this woodcarving you can see the lighted fuses Blackbeard would keep in and around his beard so that during battle a demonic halo of sparks, fire and smoke would surround him. "The interesting thing about Blackbeard is, if you were doing a ledger of who got the most treasure and was the most successful in monetary terms or plunder terms Blackbeard wouldn't make your top 10 list at all," Woodard says. "But he is by far the most famous real pirate who ever lived, and the reason is that he cultivated this image of terror." Blackbeard ruled the seas through fear. He let his beard grow wild and long, wore clothes stolen from aristocrats and cultivated an image of a wild man in gentlemen's fittings. "You had all these pirates with bandoliers and grenades and axes wearing a gentleman's wig or a woman's silk dress or scarves and all this finery." Woodard says. "His fellow pirates would be dressed up like a 'Mad Max' movie." During battle, Blackbeard would also put lighted fuses in and around his beard, giving him a demonic halo of sparks, fire and smoke. "It would be utterly terrifying to people on another vessel. And that was the whole point," Woodard says. Blackbeard also had serious firepower. "Blackbeard put 40 cannon on his ship, the Queen's Anne Revenge, and that was so he could sail up, run up the black flag, which apparently they really did, and then scare the folks into saying, 'Ok I give up, don't kill us,'" Ewen says. "You wanted to have a scary reputation." Blackbeard's scare tactics were so successful that there's no documented account of him killing or hurting anybody. Everybody just simply gave up. Until his final fatal battle with Britain's Royal Navy in 1718. "It was the gallant young Lieutenant Robert Maynard who was leading the detachment of sailors charged with finding Blackbeard," Woodard explains. "This is precisely where Robert Louis Stevenson and later the Disney movies and pop culture -- this is exactly the famous scene from where all this was constructed. "Blackbeard's battle was the model for your cliche shipboard fight between the dashing young officer and the rogue pirate," Woodard continues. Blackbeard and his men boarded Maynard's ship. Cutlass in one hand, pistol in the other, Blackbeard engaged the lieutenant in a duel to the death. 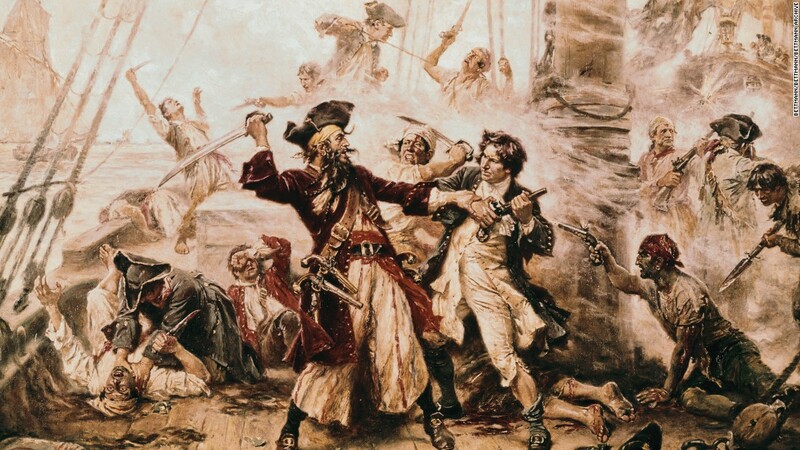 Maynard shot Blackbeard, but the pirate carried on fighting furiously with his cutlass, Maynard's own sword breaking as he tried to stave him off. As Blackbeard was about to deliver the final blow, one of Maynard's men delivered the pirate a "terrible wound in the neck and throat." 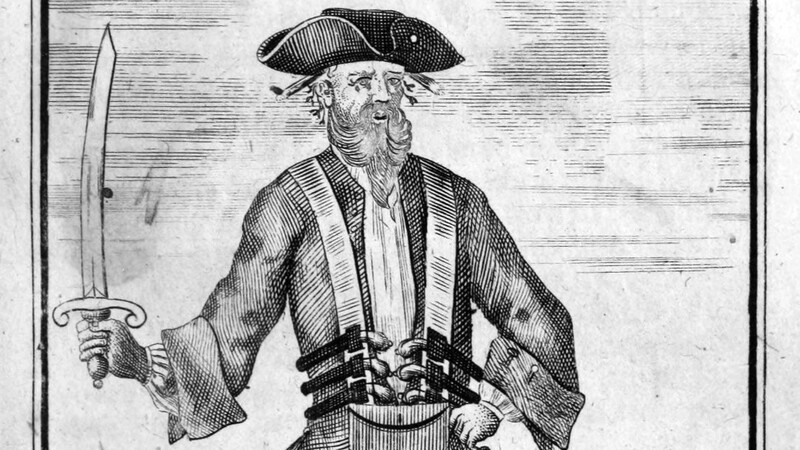 Maynard then shot Blackbeard again in the stomach and though he cocked his pistol ready to return fire, he fell down dead before he could. Maynard decapitated Blackbeard and hung his head from the front of his ship. He sailed up the east coast of America, causing shockwaves as news spread that the notorious Edward Teach had perished in battle. "There was only one newspaper in what is now the United States, the Boston Newsletter and they covered it exhaustively, as did the London papers at the time. It was the big media phenomenon of the early 18th century," Woodard says. Yet there remains a mystery with Blackbeard -- the whereabouts of his journal. The journal was recovered by Maynard and used as evidence to try Blackbeard's captured crew on charges of piracy. But after the trial, the journal, along with court documents, vanished from history. "People have been looking for it for years," David Moore, a nautical archaeologist says. Under protocols of the time, there should have been a copy of the documents in the place of trial and another sent back to the Admiralty in London. "For whatever reason that copy was never sent or it disappeared or it got lost in the filing system," Moore says. "Certainly if it had been misfiled somebody would have stumbled across it by now. It would have been too fascinating a document even though they were probably looking for something else. "To me that's odd," Moore says. Recovering the documents would likely be one of the most significant finds in pirate archaeology. Who knows, perhaps there's even a map inside with an X that marks the spot. But those who took it died a long time ago -- and dead men tell no tales.